For decades, bigger meant better for U.S. homeowners. U.S. houses ballooned from under 1,700 square feet in the early 1970s to 2,500 square feet more than three decades later. But following the housing crash, small homes – and even micro units – are sweeping urban areas. In the District of Columbia, developers are including units as small as 330 square feet in their projects. And tiny houses are now popping up in once-defunct lots and alleys. We explore the design challenges and lifestyle considerations that come with living small. Sarah Susanka Architect and author "The Not So Big House: A Blueprint for the Way We Really Live"
The Minim House, designed by Foundry Architects and Brian Levy and built by David Bamford (Element Design+Build), Tony Gilchriest and Brian Levy, has 210 square feet of interior space. The home, a bit bigger than some other microhouses at 11 feet by 22 feet, was constructed from “SIP”s (structural insulated panels) prefabricated off site. Among its features are a rollout, full size bed, a 5 foot closet, a 10-foot galley kitchen, 8.5 foot couch and a wet bath. A table can be repositioned in several locations around the house to serve a number of functions, from coffee table to an extra desk. The home also has a 290 gallon capture/treatment rainwater system. Click through the slideshow below for a tour of the home. Want more pictures? Check out the Studio Shed and 140-square-foot Matchbox home . MS. REBECCA SHEIRFrom WAMU 88.5 at American University in Washington, welcome to "The Kojo Nnamdi Show," connecting your neighborhood to the world. I'm Rebecca Sheir, sitting in for Kojo. Coming up this hour, for four decades, American homes got bigger and bigger and bigger. In the early 1970s, the average house was just over 1600 square feet. By last year, it had ballooned to 2600 feet as we added bedrooms and mudrooms and refinished basements to complete our vision of the perfect home. MS. REBECCA SHEIRBut some local architects and developers are bucking that historic trend by thinking small. Really, really small. On the southwest waterfront in D.C., a new condo development will feature 150 studio apartments with less than 400 square feet of living space. And in northeast D.C. local designers are experimenting with living spaces of less than 200 square feet and ways to maximize every square inch. Coming up this hour, tiny houses and micro living. We'll ask just how space we really need to live comfortably in a place like Washington. MS. REBECCA SHEIRAnd we'll explore whether we're ready to question the cult of square footage. We're joined today by Monty Hoffman. He's Chief Executive of PN Hoffman, a major developer in the Washington region and one of their newest projects along the southwest waterfront will feature micro apartments of less than 400 square feet. Thanks for joining us, Monty. MR. MONTY HOFFMANThank you. Glad to be here. SHEIRAnd we have Brian Levy, co-founder and developer of Boneyard Studios. That's a local architecture group that showcases tiny square foot homes. About 150 to 200 square feet in northeast Washington. Welcome, Brian. MR. BRIAN LEVYThanks. It's a pleasure to be here. SHEIRAnd joining us from the studios at WUNC in Chapel Hill, Sarah Susanka. She's architect and author of "The Not So Big" series of architecture and design books, including "The Not So Big House: A Blueprint For the Way We Really Live." Welcome Sarah. MS. SARAH SUSANKAThank you so much. Glad to be here. SHEIRYou too can join the conversation. Have you tried to downsize your living space? What were the major opportunities and obstacles you experienced? You can call us at 1-800-433-8850. Send us an email at kojo@wamu.org or send us a tweet. Our handle on Twitter is @kojoshow. So Monty, I'd like to start with you. PN Hoffman is one of the lead developers of the new southwest waterfront. And in a few years, 2017, you'll be offering studio apartments at a building called The Wharf. Now as we just mentioned, these studios will contain less than 400 square feet. SHEIRSo, this is radio. Paint a picture for us, if you will, how will these units look and feel once they're all done? HOFFMANWell, first of all, they have high ceilings, so they're nine feet plus. And one wall of the unit is almost all cabinetry. It's all built in, the kitchen is built in. We have small built in appliances, even the washer/dryer. The closets are built in. Even the bed, which is a Murphy bed, while it's up, it's a couch. While it's down, it's a bed. And then the other wall's all glass, entirely glass from floor to ceiling. And that's intentional to help make it look and feel more spacious. And then it has a bathroom. HOFFMANSo, it's, I should say, an oversized shower, ironically. So, it's not as small as you might think. It's actually very, very efficient in design. SHEIRAnd who's your target audience here? I mean, who do you expect is going to rent out these units? HOFFMANWell, rent to anybody, but I would say the target might be the Millennials. We have a variety of products that we're gonna have on the waterfront, but I would say these micro units probably will appeal more to the younger set. And perhaps even older who are downsizing. SHEIRAnd now, for decades, people in the city, they've faced a classic dilemma. Do I stay here and accept that reality of less space but more amenities like restaurants, museums, movie theaters, other things we have in an urban environment. Or do I just go to the suburbs? You know, out there, people say we can enjoy more space, it's a more car centered existence, but we can really spread out. So, do you think this trend toward smaller units is sharpening that choice? HOFFMANI think that you have to love the city. And if you love the city, and you like the cafes and the restaurants, it really is about the outdoors. If you love the city, the size of the unit is really less important. It's less important than being able to walk to the store, being able to walk to the restaurants, to the fitness center, to work, to your friend's to socialize. And conversely, the suburban environment is more isolationist. It's an entirely different choice to live out in the suburbs. HOFFMANAnd when you're living in a city, you have the freedom. You don't have the commute, the one hour commute each way. It's a healthier lifestyle all around. So, the choices aren't just within the four walls of the unit. It's all the amenity space and how it's placed in the community. SHEIRBrian, turning to you, major developers are planning for the future, obviously, with these new apartment buildings in places like southwest D.C. we see with PN Hoffman. But now up in northeast, you've been experimenting with small houses. Can you tell us about Boneyard Studios? LEVYAbsolutely. So we started Boneyard Studios back in 2012. Just a group of friends, really. We're not professional developers or architects or builders, but we were captivated by this idea of smaller living and the possibilities that could provide. Financial freedom and just kind of simpler life and perhaps a more green lifestyle, as well. So, we started Boneyard Studios, basically as a mission of showcasing micro housing. Demonstrating creative urban infill. Kind of promoting the benefits of micro living. Modeling actually what a micro house community could look like. And so that's what we've been working on. SHEIRAnd how many are there? LEVYCurrently, there's three structures, and then there's also a shed type structure, kind of the trailer park bingo hall, we like to call it. SHEIRIs that an official name? SHEIR(laugh) Now you have these handful of model tiny homes. Tell us about your minim house? LEVYSure. The minim house is a house I worked on with an architect and a builder here to develop. It was mostly after looking at a lot of the micro housing designs that were out there. To me, they felt a little bit limited and so I wanted to work on developing something that really felt fully functional as a small space. And so, I worked Will Couch at Foundry Architects and David Bamford at Element Design Build to put together this 210 foot structure. It is on wheels, so technically it is a trailer. But it could also be foundation built. LEVYAnd it really is quite a nice small space and quite functional. They have, you know, try to put all the comforts of home in it. There's an eight foot sofa. There's a projection screen TV with speakers on the side, so you get a full kind of cinema media experience. Full sized bed, large closet. I even put a full size piano, a keyboard in there. 10 foot galley kitchen. So there's a quite a bit of functionality in a small space. But of course, everyone can judge for themselves whether it would work for them. SHEIRAnd you can see pictures of the minim house at our website, kojoshow.org. Brian, I understand it also, it uses solar power and you have sort of a rainwater capture system. Can you talk about that? LEVYCorrect. So, originally, the lot we -- I bought was just an alley lot off of North Capitol and didn't have any amenities. No electric, no sewer, water. And so it was a bit of a design challenge to see what could be done on that space. And so this house does have a solar system on it. It powers most of the appliances. There's also a rainwater capture system, so (unintelligible) to the average rainfall in D.C. and figured out how much rain I'd have to capture to have a fully functioning system. LEVYSo there's a sister and it stores rainwater that comes off the roof. And then goes into an (unintelligible) tank where it's filtered in a three stage filtration system, makes it completely potable. So, it's been working quite well. SHEIRNow Brian, I want to talk definitions for a moment. We've got tiny house, we've got micro home. Are those the same things? Are they different? And if so, how are they different? LEVYYeah, Monty and I were talking about how no one's really defined the territory here. And so there's kind of range of structures of different square footage. There's a kind of a tiny house movement, which has typically been these trailer based homes. Like little houses on wheels, 200 square feet or less. Then, of course, there's foundation built homes, which can be tiny homes as well. And then, in D.C. you talk about smaller houses that can be accessory dwelling. These are like small structures disconnected from a row house, like in the backyard, like a carriage house. LEVYYou can also have small like basement units that are accessory dwelling units. So it's really a whole range and the square footage haven't really been very well defined in terms of what makes what what. SHEIRWell, Sarah, Susanka, let's turn to you. Now you're not necessarily a booster of micro living. But you've written a handful of books about making the most of small spaces from both an architectural perspective and a design perspective. And your writing has influenced a lot of architects who work in this field, so what do you make of this new push for not just living small, but building small? SUSANKAWell, I think, for me, it's very exciting opportunity, because a lot of people are wanting something better designed. And of course, we can take our dreams and make them any size we want. But making it a little smaller and a little better allows you to create space that really fits you to a "T." It's more like -- you know, it's tailored for the way that you actually live. My book series, "The Not So Big House," was really trying to help people who were building, in my mind, way too big houses. SUSANKAAnd help them take that same dollar amount and make smaller and better spaces. But what's happened -- I was actually inspired to write this series, in part, because I lived for a period, in a micro home. And so, I realized, I needed very, very little. And I had, you know, a very rich life living in that small of a house. SUSANKAWell actually, the most small I lived in was 96 square feet. SUSANKASo that was when I was going to college. And it really taught me a huge amount. And so, it's interesting to me now, to watch how the movement to have both tiny houses and the micro homes are really a -- it's almost like a reiteration of that original motivation. To look at how do we build smaller but better? And I have to clarify for those that are listening, a lot of the books that I write are about houses of many different sizes. I usually describe what I do as being "A Not So Big House" is about a third smaller than you thought you needed, but the same price. SUSANKASo that you're really putting the dollars into the quality, rather than the quantity. SHEIRSo, what would an example of that be? Would you do away with, say, a living room that might not be used? SUSANKAA lot of -- I actually moved from England when I was 14-years-old, to Los Angeles. And I saw houses that had a good half of the square footage unused because they were made for formal occasions that nobody actually had anymore. So I thought, why are we doing it this way? So I became sort of an outsider, looking at American culture and thinking, there's got to be a better way. And so, a lot of the spaces that I suggest eliminating are those that you use less than six times a year. What happens with the micro house and the -- you know, really a lot smaller houses, is that we make spaces do double duty. SUSANKAAnd that's what Monty's talking about and that's what Brian's talking about. Spaces that really do multiple functions. We don't need to duplicate that square footage when we're using a space at different times of day, like a bed that can fold down, as Monty was talking about. Take up that square footage. That's a lot what I write about, is how to make less square footage do more. SHEIRAnd you also talk in your book, I thought this was so interesting, ways that you can make a small space look and feel bigger and more practical. For instance, playing with ceiling height. Describe that. SUSANKARight. Well, this is a very interesting notion that most of us are not tuned into. When we think about making a house that feels bigger, we assume, you know, take out all the walls and it will feel bigger. But in many ways, that doesn't work, because our eye just sees a quantity of space, but it doesn't see separate places. So what I've used in my work is to lower ceiling heights in places to create a sense of an alcove or a smaller space within the larger space, but without obstructing view. So, your eye then believes that you're seeing more square footage, even though, in actual fact, you've taken out some volume in a couple places. But we perceive more space. SHEIRAnd people naturally gather at places with higher ceilings. SUSANKAThat's right. So, the higher ceiling place becomes the gathering place and the lower ceiling places become the more intimate, you know, could be the bedroom area, it could be an eating alcove. That sort of thing. But it adds a lot of personality, relatively inexpensively, and creates a sense of more square footage. SHEIRIf you'd like to join the conversation, we're talking about micro houses, micro living, tiny houses. What's the smallest space you've ever lived in and how did you make it work? You can call us at 1-800-433-8850. Send us a tweet. Our handle is @kojoshow. Go to our Facebook page or send us an email, kojo@wamu.org. Now, earlier, Monty, I asked who your target audience was for your studios. SHEIRAnd you said just about anyone, but millennials, younger folks might be interested. So, clearly, you see a huge generational shift at play. There's this pent-up demand among millennials for different kind of housing than their parents wanted, for instance perhaps. HOFFMANFor sure. I mean, there's so many differences, not the least of which I think the baby boomer generation for which I belong to is, I would say, more obsessed with ownership. While as the millennials are more obsessed with experience and information. It's a real shift and, I would suggest, for the better. In addition to that, you have the millennial -- the young adult energy that is pouring into the city right now. HOFFMANIt's a very exciting time. And we talk about micro houses. You could expand that -- I know that's not the point of the topic today, but you could expand that to office space. You can expand that to grocery stores, reducing those from 50,000-square-foot prints to 25,000, movie theaters from large Cineplex's down to boutique, restaurants. A lot of changes happening in real estate right now, residential being one of them. And a lot of it is being driven by the millennials. SHEIRSarah, do you see that same generational shift going on? SUSANKADefinitely. There's -- in fact, millennials really embrace a lot of what I've written about because, as Monty was saying, they're looking for very different things. They've lived often in the suburbs growing up and don't want that, you know, acres and acres of space that have to be maintained. They tend to get together in their houses in very different ways and they see the house as a platform for experience. SUSANKAAnd so, it's a whole different operation what happens in the house. They're also much more informal and so willing to very quickly let go of rooms that, in the past, we're told by real estate agents for resale. They're just not interested. SHEIRWe are talking micro living, micro houses and tiny houses here on "The Kojo Nnamdi Show." I'm Rebecca Sheir filling in for Kojo. Have you tried to downsize your living space? What do you believe are the basics we need in a livable space? After the break, join the conversation. You can call us at 1-800-433-8850 or send us an email. We're at kojo@wamu.org. SHEIRWelcome back. I'm Rebecca Sheir, sitting in for Kojo Nnamdi. We're talking with Monty Hoffman, chief executive of PN Hoffman, a major developer in D.C., Brian Levy, co -founder and developer of Boneyard Studios and Sarah Susanka, architect and author of "The Not So Big" series about micro living, micro houses, tiny houses, tiny homes. To join the conversation, you can give us a call at 1-800-433-8850 or send us an email, kojo@wamu.org. SHEIRSo we got a tweet from Foundry Social Justice. I'm going to turn to you, Brian. They said, "Ask your guest about affordable housing." And I understand that you think that part of this trend for micro living isn't just wanting more -- you know, a smaller space, it's the fact that we can't afford anything bigger. Can you talk about that? LEVYAbsolutely. I mean, D.C. is a particularly sad example, in some sense, of affordable housing. We've lost about half of our affordable housing units just in the last decade. D.C. media home values have doubled. Rent for one-bedroom units have gone up 50 percent in the last 10, 12 years. So there really is a bit of a crisis here. And so, the philosophy here is we really need to kind of explore all the options, all of the above. LEVYMicro units and, you know, apartment complexes such as PN Hoffman is developing, accessory dwelling units, like small units behind homes, even tiny houses, maybe even tiny houses on wheels kind of, you know, beautiful trailers. And we find at our open houses, we just had 400 people come out yesterday, it's at the Boneyard Studios open house, what's primarily motivating folks that we find is not so much eco-green but the money. LEVYThey've either lost a house, they don't want -- you know, they can't afford a mortgage. They are getting older and perhaps wanted the retirement funds to keep, kind of aging in place. And so, affordable housing is really the primary driver that we've seen. SHEIRSo, (unintelligible) Monty, I'm going to put you on the spot. How much is rent in the smaller units in your luxury studios? HOFFMANThe rent we expect to be below $2,000 a month, which would allow someone making about $65,000 a year to live one of those units. And not to be confused with affordable, we have actually a great stock of affordable housing that we'll be building along with the micro units, along with workforce housing and market and empty nest or so and even house boats, so it's a composition, just one part of overall composition. HOFFMANBut it clearly is more affordable than obviously a larger unit and it provides the freedom for many people to get away from the car, away from the commute and away from large bills at the end of the month. You know, whether they have to or not, they can do it by choice. SHEIRLet's turn to the phone now -- phones now. We have Joel in Tacoma Park. Joel, go ahead please. JOELHi. I'm calling to ask a question about if micro living has been thought of for families, specifically with, you know, young children or teenage children? It seems like teenage children specially kind of need their own space as they're going off and becoming adults on their own. Have options been thought about for that? Do you know? SHEIRMonty, you want to take that? HOFFMANSure, sure. You know, that's a very good question. We are looking at that as well. And we believe that, you know, the next wave of the millennials will be young families, and we expect that. And from the development world, it takes us almost five years from idea to fruition on a large project. And so, we're already looking at small micro living as the term that you put. And I guess that would be appropriate. HOFFMANAnd that is a bedroom with an extra den and bathroom, something that you can build that provides some privacy and rooms in it, but still keep the cost somewhat affordable. So that is something I can -- I see in the next wave of our design. SHEIRSo we don't just have to decamp to the suburbs? HOFFMANWell, that's my hope. You know, some will still choose to go to the suburbs. But my hope is that many people will decide to stay in the city for the very reasons they were drawn to in the first place. And it's, you know, up to us planners, developers and the like to be able to find those products that are attractive to them. SHEIRAnd, Brian, I think it's interesting you said with your open house, you know, it wasn't just young, single people, you -- all sorts of people. Did any families with children come and take a look? LEVYSome families do come. There's a lot of curiosity about the site and space. I don't think any of us were saying, you know, these micro houses are, you know, the answer for families. They are small. They're best suited for one to two people max, especially talking about 200, 300 square feet. I guess there's a point to say that really the micro house trend is perhaps responding to D.C. demographics, like in the city about 45 percent of the households consist of a single person living alone. LEVYThat's like one of the highest rates in the country. And so, really, is the housing stock there to meet that demand? And so, we're trying to demonstrate -- these creative small spaces that could be a model. SHEIRSarah Susanka, you recently wrote an article in the Wall Street Journal about the house of the future and in it you said many younger people think about their house as a kind of portal to access the world. They kind of see their living space as an extension of their devices. Can you explain what you mean by that? SUSANKAYes. In many ways, I think our world is becoming more and more virtual. And so, you know, we currently engage our various screens and we have more and more access to everything we might be able to conceive. My sense with the house is that if we could look, you know, 10, 20 years down the pike, we'll find that our houses are even more, in a way, they've become the screens. SUSANKAIt's one thing I've envisioned for years and years is that we will all have a lot of our work done in-home, like an in-home office, but one wall of that house will be a wall that will -- will be a huge screen that will allow us to meet with anybody we want to. We'll all have those screens in our house. So it will be like a face-to-face meeting, but we will just be meeting virtually. It won't look that way, though. SUSANKASo that's the kind of thing I think is coming because we want the experience of being close to each other, but we love the convenience of what the internet has done for us to allow us to be anywhere we want to be. SHEIRI want to go back to something Brian said. You keep talking about these houses being on wheels. Why is that? LEVYSo many different reasons. Typically, folks will be building these partly to get around the local zoning. They actually can't get permitted to build a small structure on their land, so they'll put them on wheels instead. Although a lot of folks just want the mobility or perhaps they're moving across the country. I've had a number of military folks contact me that they've moved around the different bases around the country and they're curious about how they could maybe bring their house with them. So it's really mobility and codes that is motivating. SHEIRSo D.C. law sort of comes into play when we're talking about this kind of experimentation and creating new spaces. SHEIRNow, Sarah, back to you. From a design perspective, you say American homebuilders and homebuyers have tended to think about their houses in terms of how they think they should live, not necessarily in terms of how they actually live. I think that's a really interesting distinction. SUSANKAIt really is. You know, I learned a lot of this by working with literally thousands of clients over several decades. And when I would ask people what they wanted, they would actually tell me what they were expected to need as opposed to what they actually use. And which is I think a big reason why our houses have gotten bigger and bigger in the recent decades. And so what I would ask my clients to do is tell what do you actually use? SUSANKAAnd then I would design the house to serve all those functions. But in many cases, they have one room that they thought they needed two spaces for that would do double duty. For example, the most obvious one is the formal dining room and the informal dining area, typically our informal spaces aren't particularly pretty and the formal space that's put into the best spot in the house, the best view. SUSANKAWhy not make your everyday space lovely to be in and recognize that your friends when they come over want to be where you are, what you enjoy and, you know, make it one place. So it's simple stuff like that and it's absolutely applicable to the micro house as it is to any scale of home. But it's more important with tiny houses and with micro homes because you've got to make every square foot really work. It's got to be doing many things for you if it's going to be a comfortable place to live. SHEIRLet's go back to the phones again. We have Abraham calling from Richmond. Abraham, your turn. ABRAHAMYes, I recently moved from a 5,000-plus square foot house and now I live in a 30-square-foot small house with my two boys, one of which is nine, the other one is 12. And this experience has totally transformed our lives. Our lifestyle is a little bit more healthier. We have less food in the space. We -- and the boys tend to a little bit more community oriented. They tend to want to share a little bit more. ABRAHAMAnd I think it's from the experience of living in a, you know, space that they have to share. And, really, I'm hoping -- I'm thinking that this is probably a permanent change for me. SHEIRSo you're not stepping on each other's toes, instead you're sort of learning more about sharing. ABRAHAMWell, they just became more aware of it because I think they realized that they have to share their space. For example, instead of going up to their room to eat and watch television, we eat together because the space is so limited and we watch TV together. Even the books that's on the wall, they tend to remember all the titles of the books because the books is always in their presence. And so, you know, from that experience alone, I -- this has been really a transforming experience for all of us. SHEIRBrian, is that something you've seen in your experience? LEVYIt has. Abraham, I've shared your experience a little bit. I grew up in Houston suburbs in a 5,500-square-foot McMansion. You know, we got a dining room and a side dining area and a living room and a rec room and a library, et cetera, et cetera, six bedrooms. And the experience of downsizing is really somewhat transformative. One thing that -- I'll quote my favorite psychologist here, Jonathan Haidt who wrote the book a number of years ago called, "The Happiness Hypothesis." LEVYHe identifies this principle, the adaptation principle, that when folks step into a house, they sometimes think, oh, it's so small. What happens is the limits we find ourselves constrained by actually start to feel less and less inhibiting with time. And so -- with a few exceptions. You know, the time -- in time, these limits become the new normal because, neurologically, what's happening, so our brains are most sensitive to changes in conditions not absolute levels. LEVYSo probably when your family moved in to that 300-square-foot house, it was like a little bit of a shock, but I'm curious about, you know, within a month I would imagine everyone was fairly content. SHEIRWell, thank you so much, Abraham. We have a caller now, Diane. And, Diane, it's your turn. Go ahead please. DIANEHi. I'm calling because I noticed the population is aging with the baby boomers coming into fore. I wonder if there's any consideration for building houses that give the opportunity for separate living spaces along with maybe a shared space like a kitchen but having a larger bedroom and bathrooms, suite area with maybe kitchenette on the opposite side. I think sometimes when you're looking for a house, you have to find the four bedrooms and spaces that are designed to accommodate families. DIANEAnd that's -- not everyone has children or plans to have children. So are there any efforts to move towards that so that you can still have space, yet you could share the expenses because you either have a house that has an apartment, a rental unit or suites that give separate living opportunities. SHEIRThank you. Monty, you're on the developer world. Do you see anything like that in the plans? HOFFMANWell, I think what Diane is describing is guest suites that would be inside of a home or adjoining to a home. We do have some products that we're delivering like that. It's not a lot. We don't find that market to be that deep. They can get quite expensive because when you're talking multiple family, it's just a more expensive proposition. If you're further onto the suburb, it's a little bit easier to do. HOFFMANBut that's why I said earlier, I mean, we like to have the diversity and the variety. So it's part of an overall composition. So, yes, there are empty nester suites that we've -- we have online now and that we're developing right now. SHEIREarlier in the show we referenced the occult of square footage. And, Sarah, do you think we have an unnatural obsession with square footage. It's square footage for square footage's sake as oppose to actual utility? SUSANKAWe do. I think so. In fact, I think every architect and builder in this country struggles with this because when people come in to your office to start with, they're thinking about a particular amount of square footage. And I often point out that the quality of home that we're looking for has almost nothing to do with size. It's a quality and not a quantity. And so, what I try to do is to help people see that the size itself is not what you're looking for. SUSANKASo I think my books, in some ways, have helped to change the discussion from how big is it to what's the quality of space and how well does that work for me? I think that's incredibly important. HOFFMANIf I can add to Sarah's comments, because I completely agree with that. The challenge that we face is that, you know, square footage is a quantifiable metric. Everybody gets it. And the lending industry absolutely uses that to benchmark and to comp other suitable homes for the loans that it will make, same with real estate agents. They're looking at the same metric. And so the market, unfortunately, has been conditioned over time as well as the industry on square footage. And it is something it will take us a while to change. But I agree with Sarah's comments completely. SUSANKACan I say one other thing about -- in response to Diane's question? SUSANKAAlthough I suspect this isn't part of the project that Monty is doing, she might be very interested in looking into co-housing, where a lot of people get together. They have shared gathering space, but individual, smaller quarters. And I bet that that's something she would find very useful. SHEIRAll right, we are about to take a quick break. But if you'd like to join the conversation about micro living, micro houses, tiny houses, please give us a call, 1-800-433-8850. Visit our Facebook page, send us a tweet, our handle is @kojoshow or send us an email kojo@wamu.org. I'm Rebecca Sheir, sitting in for Kojo Nnamdi. SHEIRWelcome back. I'm Rebecca Sheir sitting in for Kojo Nnamdi. We're talking about micro housing, micro living, tiny houses. Our guests today are Monty Hoffman, chief executive of PN Hoffman, a major developer in the Washington region. One of their newest projects is in Southwest and will feature micro apartments of less than 400 square feet. SHEIRWe also have Brian Levy, co-founder and developer of Boneyard Studios. They're showcasing 150 to 200 square foot homes in Northeast Washington. 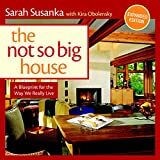 And joining us from the studios at WUNC in Chapel Hill is Sarah Susanka, architect and author of "The Not So Big" series of architecture and design books, including "The Not So Big House: A Blueprint for the Way We Really Live." SHEIRWe have this tweet now from Dara, who brings up an interesting point. Reading the tweet here, "These spaces are not accessible for all. We have the Americans with Disabilities Act, but people with disabilities are being left out." Monty, how do you plan on tackling that with your development? HOFFMANYeah, that's a very good question. The American Disabilities Act is -- everything we do is subject to the American Disabilities Act. And, of course, we follow that. It's -- the law has been evolving since '92. And then, actually, the spaces for disabilities have actually gotten larger over time. So all of that is included into our design. So even micro units, the bathrooms are all FHA and ADA compliant. The room -- the living areas and the like. HOFFMANSo it takes a great deal of creativity to, you know, to coexist, as we should, with disabilities, with tight spaces. But it requires a lot of thought with that. But nobody's excluded. SHEIRLet's turn now to other cities. Brian, the way you talked it with D.C. regulations, perhaps the nation's capital is not the most hospitable place for small dwelling units, but some cities have indeed embraced the idea. Tell us about, for example, Portland, Ore.
LEVYSure. And Portland has really made some changes in the past years that have allowed accessory dwelling units to become much more prevalent. ADUs, is kind of the urban planning parlance, but basically you're talking about carriage houses, granny pads, these kind of small structures behind a house typically. And so by changing some of the zoning regulations they've been able to develop a lot of these small structures, which have increased the supply of affordable housing in the city. LEVYAnd they've also been able to allow people to like age in place, they can build one of these small structures and rent it out behind their house. And so they've -- they're sort of, I believe, at the forefront of this in the country. And D.C., as many listeners may know, we're at the end of a seven-year zoning rewrite process that the office of planning has been working on and doing excellent work on. But one of the key issues during that rewrite has been ADUs and what regulations do we have to either encourage those or discourage. LEVYAnd the latest rewrite has taken a step back, unfortunately, in terms of allowing more accessory dwelling units, making it more difficult for folks anywhere in the city to be able to develop these spaces behind their homes or even inside their homes as basement apartments. So we're much -- as part of our projects at Boneyard Studios -- encouraging folks to write and weigh in at this very critical time in the zoning process to encourage the city to allow accessory dwelling units. SHEIRSarah, what are some cities you've seen that maybe D.C. could take a look and take a lead from, in terms of micro living and doing it well? SUSANKAWell, I certainly -- Portland's at the top of my list on that. I've also been working with a developer in Chicago that's doing some ADUs, accessory dwelling units, as part of their development project. So I think there's this kind work going on in many cities around the country. We're learning, gradually, from each other how to do it well. I think it will be the way of the future. I think a lot of the fear of accessory dwelling units that has colored our zoning codes and ordinances for the last several decades is a worry that somehow it will degrade the neighborhood. SUSANKAAnd I think far from that what we're discovering is that it strengthens community. And I think that's a really, really important part of what these smaller dwellings allow, is a much wider diversity of types of households, which we desperately need today. Where very few of us, anymore, the nuclear family that we were 50 years ago. So it's much needed and there's a mindset that's not quite been caught up with by our zoning codes as yet. SHEIRWe have a call here from Matthew. Matthew's calling from Falls Church, Va. Matthew, what do you think? MATTHEWWell, I was wondering, my family, we live in about 1,100 square feet in Falls Church, which I don't know that it is necessarily micro living, but there's four of us. And I was wondering, any resources to find affordable ways to make small living work or -- I'm sorry -- affordable resources to make small living work for our family. SHEIRSarah, do you want to take that? SUSANKAI -- yes. I have a suggestion for you. There's a book -- it's a little self-serving, but "Remodeling the Not So Big House" or "Not So Big Remodeling" is really what you need to make less square footage feel like more. And so you can take that 1,100 square feet, and without a lot of additional dollars, really make it work better for your family. SUSANKAI'm just trying to think, yeah, it looks -- Brian, do you have some suggestions there? LEVYWell, this is not an affordable suggestion, but I'll get to the affordability. There's a great store in New York called Resource Furniture. And they bring in all these kind of high-end Italian designs. But you can look at what they're doing there in terms of module or integrated multi-functional furniture and higher a carpenter to basically replicate it at perhaps a, you know, a 12th of the cost. SUSANKAThat's a great idea. Because really, what you have to do when you're trying to make something affordable is to mimic good ideas. Because they're all -- there are lots of them out there. And often times the ones that are illustrated in magazines and books are a high-end version. They don't have to be high-end. You can do them really inexpensively. HOFFMAN…nobody thought any different. That was normal. And so I think with a little bit of creativity you should be able to make whatever alterations to make that, you know, a nice home. MATTHEWOh, no, absolutely. I just was curious about suggestions. SHEIRAll right. Well, Matthew, thank you for calling. SHEIRSo while we're talking about affordability and economics, a question, how much of this move toward smaller living was catalyzed by the economic meltdown of 2008? HOFFMANI think that was a shock to everybody. Anybody who was in real estate went through a difficult time. I think also homeownership changed. You know, the past, the paradigm was that that was a sure investment for your family savings. I think people no longer really believe that. I see a lot of people who are now rent by choice. It's not necessarily that they need to rent. They just look at it much differently. HOFFMANI think it really had a shockwave through the culture. And I think there's a little bit more value, in terms of judgment, that people are making today that, you know, in the mid-2000s it was sort of self-indulgence run amok. I mean, we call it the -- I call it the big hair -- big hair designs, you know. You look back on a picture of 1984 and everybody has the big hair. It was kind of like our designs in the early 2000s. I mean it, you know, the market is our client. That's who we serve. HOFFMANAnd that market kept getting larger and larger and larger. And the demands and the expectation kept growing. But after 2008 it all adjusted. It's a much different paradigm today. SHEIRYeah, Sarah, you wrote your -- one of your books in 1998. And I understand the second edition came out around 2008. So a lot of change. SUSANKAThat's right. Yes. And you know what was fascinating, when I wrote the first book in 1998, a lot of people thought I was crazy to talk about downsizing or what I've come to call rightsizing, because downsizing has such a negative or pejorative connotation. But now -- and I think especially since there the recession, almost everybody's willing to look at the idea of downsizing, realizing that they didn't really need that much square footage and it became a big burden during the recession. SUSANKAAnd so we've had a shift of our thinking about what a house is and so the fascination with the tiny house and the micro homes I think is a reflection of that, of looking at the furthest extreme and saying, you know, even that's possible. And for some people that's a great opportunity, especially in a city where the city is really your living room and the micro home or the tiny house is the place that you retreat to. That's your private shelter, but the rest of the city functions as part of your home. SHEIRInteresting. And another part of the city here in Northeast, in the Brooklyn neighborhood, Catholic University students are building an apartment complex out of shipping containers. And, Brian, I hear you want to put a shipping container in Boneyard Studios to use as studio. So what's so attractive about these big metal boxes as a living space? And I'm just trying to picture it. How does it even work? LEVYYeah, I don't know exactly. The cargotecture movement has been kind of growing in leaps and bounds. When you're talking about a single shipping container, we actually had one on our lot for a while to use as a storage container, not a living space or anything that's a showcase space. And after having walked in and used the space for a while, I couldn't really find a way of making it real useful or a great space to be in as a single unit. LEVYNow, the cargotecture models that are more compelling, I think too many, are where you have multiple shipping containers. And I believe that's what the Brooklyn folks are doing, where you have multiple cargo containers connected to each other and using those as kind of a foundational structure. And, of course, you're reusing, you know, these containers that would otherwise perhaps be destined for the landfill otherwise. SHEIRSo then we've got some environmental things coming into play. Well, on that note then, how much of this move toward smaller homes is driven by environmental concerns? LEVYFrom what I've found, we found at Boneyard Studios, during these open houses, there's definitely, you know, a lot of people are coming out there. They're all, you know, concerned about the environment, but mostly it's really a focus on affordable housing. Is there something here I can afford and not have to pay a mortgage on? There's obviously the benefit of kind of simplicity living and having the lower carbon footprint. But it's really the, you know, the dollars in the pocket that's talking here. SUSANKARebecca, may I weigh in on that one for just a second? SUSANKAThere's -- what's interesting is that in the -- in cities like D.C. where the prices of rent and new -- buying a new house are so expensive, then the focus for the micro house is on the affordability. But there are many areas of the country where that's not the issue. And then you find that the people that are really embracing this are -- tend to be very much green and sustainability oriented. So, in a way, the movement has two aspects to it, but certainly I've talked to many who are very eager to build their own tiny house, who are also very heavily into doing the best thing for the planet, as well as for themselves. SHEIRReturning to the phones now, we have Raj, in Washington, D.C. Raj, go ahead, please. RAJYeah, thank you for discussing this topic. I have been looking forward to this. I live in D.C. Southwest, and for me this is about being in the city, being able to go to places easily and I would like to know whether I can buy a place for like 40,000, 50,000, a small place where I can rest, but, you know, that is green and that has a balcony, a more open air, more light, things of that nature. And also, in terms of the regulation, do you know what the D.C. City Council is planning to do? Thank you. SHEIRYou said $40,000 to $50,000? HOFFMANRaj, that's a tough one. We have some affordable residences, they're in our Phase I. Those are rental. If one qualifies for that -- and actually there's quite a few. We have probably 180 in just Phase I that are about half of that is the 30 percent of median income and the other half is about 60 percent median income. So that is all available. As far as for sale, that becomes more difficult. For sale to be at that price range is very difficult to make that viable. So -- but rental may be an option on that. SHEIRAnd, Brian, if we wanted to build our own tiny home, furnish it as much as we need to, how much would that run us? LEVYIt all depends on the price of labor, but materials are typically, you know, $20,000 to $35,000. And you can often double that with the labor costs. You know, currently it's tough. You can build a tiny house, but there's really not a lot of places to park them in the city. Maybe you find a friendly neighbor and you kind of do a little bit under-the-radar. I think it brings up the larger point of the need for more affordable housing in the city and relaxing regulations a little bit so you can allow more accessory dwelling units to be constructed so that there's a larger supply of lower cost housing. SHEIRSomething else we haven't talked about is an argument that could be made against this sort of micro living and micro housing. The fact that cramming so many people into such a small space might, you know, pose health, you know, and safety hazards. What do you think of that? LEVYWell, I -- you can make any argument, I suppose. I certainly wouldn't agree with that. I think that small residential and density, in general, is green. You know, probably the greenest city in the country is New York City. If we all lived like that we would actually have buffaloes roaming right around -- outside right now in Washington area. So it is more sustainable. I would suggest it's actually more healthy because when you have a walkable lifestyle, you're not bound to a car, you're not in a car for an hour commuting back and forth. LEVYYou're walking to the grocery, you're walking to the cafes and to your work. And that's healthy. And we need to get more into that. The types of designs that we're doing have a lot of areas outside of the residences themselves for people for gathering. And that's obviously intentional. The fitness centers, the lounges, the different areas, you know. And with the iPad and other technology we can work and chat and do that anywhere. And I think people are comfortable in social rooms and areas with others, as opposed to being isolated inside of a room. SHEIRWell, that is all the time we have for today. I want to thank our guests, Monty Hoffman, chief executive of PN Hoffman, a major developer in the D.C. region. Brian Levy, a co-founder and developer of Boneyard Studios. And Sarah Susanka, architect and author "The Not So Big" series of architecture and design books. Thank you so much, everyone. SHEIRI'm Rebecca Sheir, sitting in for Kojo Nnamdi on "The Kojo Nnamdi Show."